Trout is easy to come by in Montana, either at the store or out fishing. 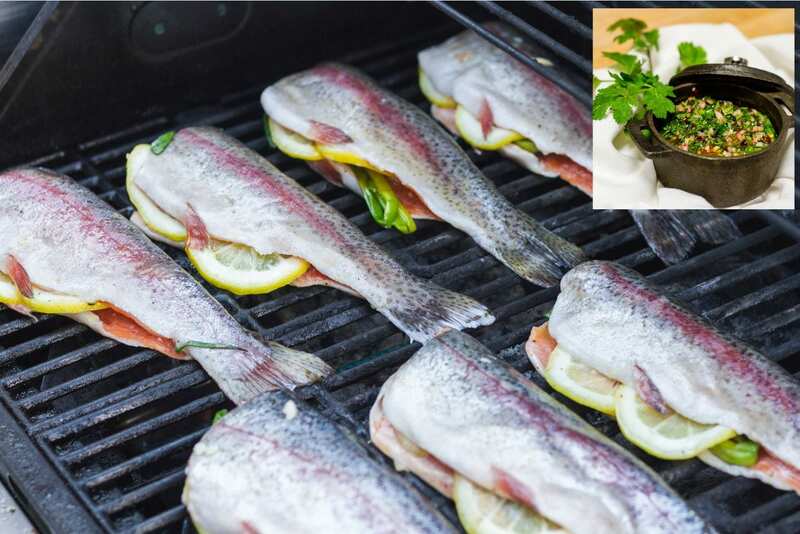 The trout for this recipe comes from Flathead Lake, an hour north of Missoula. Cut Lemon into 8 thin slices. Salt and pepper the inside cavity of each trout and place 2 lemon slices and 2 green onion stalks. Rub outside with olive oil. Place trout on grill and cook about 7 minutes on each side. Meanwhile combine all the ingredients for the chimichurri. Stir by hand. Do not mix in a blender. You want noticeable pieces of garlic, red onion, and cilantro. Place trout on a platter and spoon the chimichurri over the top.